Outlined are various airport transport services to get to or from Rotorua's airport. The airport is small so you won't have to worry about getting lost in a melee of people. Staff are friendly too if you need a hand. One option to get to or from the airport is to catch a Supershuttle. Supershuttles provide a great cost-effective service taking you right to your destination. I've used them myself numerous times and have always found the drivers friendly. They have fixed fares which is great for the budget. You share the shuttle with other passengers but it can be booked exclusively also. Taxi chits and all major credit cards are accepted for payment. Just ask your friendly driver. No bookings are required. When landing at the airport, if there is no Supershuttle out front, a phone is available. The number is 0800 748 8853. As a little side note, Supershuttle's are used to ferry stranded passengers to their destinations when planes are cancelled due to weather etc. If budget is a consideration, buses run between the central city and airport every half hour beginning at 6.40am. The last bus of the day leaves the airport at 6.10pm. It will cost $2.80 at the present time to get into or out from the center of Rotorua. 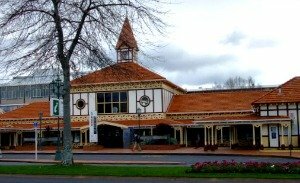 When flying in, the i-Site (Rotorua Tourism information center) is a good place to get off the bus. You will easily recognise the stop because the building (as in the photo) is tudor looking. Not in view on the right is a clock tower. This is the central hub for buses with quite a number of backpackers, motels and hotels within a few blocks of the i-site. A number of car rental companies can be found at Rotorua Airport; Budget, Avis, Thrifty, Europcar and Hertz. All are well-known and trusted brands in New Zealand. Input your dates on the form below and Drivenow, a comparison website, will bring up all makes and models available for your dates. Using a comparison search engine like this makes the job a whole lot easier. The only one I have personal knowledge of is Budget. Having made use of their services a number of times, the vehicles were in good condition, clean, smelt great and there were no problems at all. Xquizit Limousines & Tours will meet you at the airport, deliver you to your destination and deliver you back to the airport. 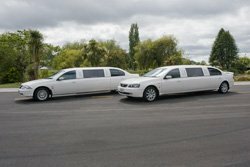 Xquizit's Airport Limousine transfers are not confined purely to Rotorua though. Also included are Auckland, Tauranga, Taupo and Hamilton Airports. In addition, Xquizit Limousines & Tours offer various tour and corporate services. This business is owned and operated by locals Anne and Brian Norton. I must have first met Anne a few years after they began their business in 2004. She is a lovely woman who is passionate and committed to both her business and her clients. Further enquiries can be made on Xquizit's website. I know that Taxis operate from the airport but I couldn't find out too much about our Rotorua ones apart from the basics. As of Feb 2019 it would be approx NZ$35.00 to travel from the airport into the CBD. It is a call center based in Rotorua. With over 400 long and short term outdoor spaces, Rotorua airport parking is so plentiful you don't even have to book. If you want to pop out of town for a time and have your vehicle handy for your return, it's a good option. Located out front of the terminal, the area has security fencing, good lighting and CCTV coverage. It wouldn't even be a 100m walk to the furthest park. Secure car parking is also provided for those with disabilities.